countries is accelerating at a faster rate than it did in industrialized countries. Figure 1. 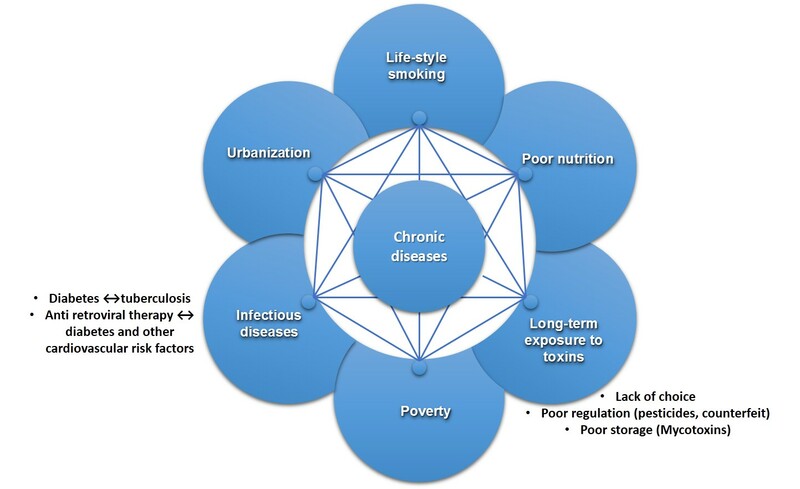 Schematic figure showing the cause of chronic diseases. This project, aims to explore the advantages of traditional fermentations methods of whole grain consumption and current knowledge of cereal bioprocessing in order to develop affordable and acceptable cereal fibre-rich products for both Africa and Europe. The project takes a multidisciplinary approach, bringing together experts on food technology, food chemistry, microbiology and nutrition in Africa (Kenya and Burkina Faso) and Europe (Finland and Portugal). The current project focuses on studying tailored fermentation processes with carefully selected lactic acid bacteria, for whole grain wheat bread in Africa and whole grain gluten-free products made from sorghum and millet for Europe. The project begins with assessment of dietary fibre consumption and the role of whole grains or cereal dietary fibre in Kenya and Burkina Faso. To develop high quality whole grain products, starter cultures that efficiently deliver functional metabolites (exopolysaccharide, antimicrobial compounds) will be isolated, and characterised from traditional fermented products in Africa. Factors that will ensure enhanced production of the functional metabolites in model fermented whole grain matrices will be optimised. Consequently the potential starter cultures will be utilised to tailor fermented whole grain products. Emphasis in design will be natural, additive-free products with at least 6 % dietary fibre content. The results obtained from this project will enhance knowledge on dietary fibre intake in the African partner countries, the properties of functional metabolites from the selected isolated starter cultures and their optimisation for whole grain and cereal fibre-rich products. The results obtained will be disseminated to the public, scientific and industrial community. Partnership with local authorities will be encouraged throughout the project.